This article is for folks familiar with analog and RF principles. The 147.20 repeater for most is ONE big coverage repeater, and all the links and equipment switching is transparent to normal use. Not to be confused with the Seattle "link" switch or other system enhancements. This discussion is just about the 20 repeater itself. A user just uses the repeater like any other repeater on the 2 meter band, to talk to another station. What goes on behind the screen is really a lot. IF you feel you want to know all that goes on, this article is written for you. It may take a while to really understand what's happening every time you press you mic button. If you would rather just go over the operational lines, go back and click on the key word "Responsible" on the home page. The system is made up of several input satellite receivers on 147.80 MHz mostly in Spokane with a few out of town in Eastern Washington. Four system transmitters on 147.20 MHz at Spokane, Wenatchee, Omak and Yakima cover most of the East side of the state with base station (or better) coverage. The satellite receivers in Spokane are down-linked to a control point, which has all repeater functions, such as tail, time out, IDer. The satellite receiver in Wenatchee operates the associated transmitter on 147.20 there, and is linked 150 miles to Spokane to be part of the rest of the System. The other two areas, Omak and Yakima are linked back to the Wenachee part of the system, then to Spokane. From the control point output, the user's signal then is processed and up-linked to the Spokane transmitter site, and linked 150 miles back to Wenatchee, Omak and Yakima with wide coverage, to balance the receiver's coverage. All the remote Spokane receivers are carrier squelch (CS) on the down link to the control center, which has sub-audible (PL) decoders for most of the satellite receivers. One or two receivers can be left in carrier squelch mode to assist a newcomer without the proper access information. Normally, current supporters have the correct information so they can access the entire system. All the (backhaul-background) links are very short squelch burst time, making them transparent and to make the system nice to listen to. The slight burst that is heard is enough 'que' a user had un-keyed therefore, a (dis) courtesy beeper is unnecessary. This is accomplished by shorting the time constant on the user access points (receivers). The 80 receivers's noise rectifier filter capacitor are lower in value around 1/5 to 1/8 of their original, depending on how much of the original's squelch burst time. Some receivers such as the Motorola Micor do not need shortening of the squelch, thanks to the special I.C. with dual constants. In fact, the "short" constant has a phenomena which "blanks" out the user signal intermittently during a mobile with some multi-path propagation into the system. The cure for that is increasing the "short" constant cap, which add just a little longer squelch instead of the "thump" you hear on a stock Micor squelch. Previously the user signals were time domain voted in the Spokane area. The TDV logic lets only one satellite receiver (path) through. If the user nulls out due to moving, the TDV looks for another satellite receiver path available, and lets it through the system. There is one limitation it had. The TDV logic is not a signal quality "voter". If the user's first receiver access is a noisy path, it would stay that way, even though another receiver path is much quieter. This would normally happen only with a non-moving station. Most mobile/portable users move around a little which probably would null out that first receiver and get into the better path. As of 2007 a "real" voter was installed on the system which takes care of that "stuck on noisy receiver" problem. Also, the 2 meter link between the UHF repeater and the 20 repeater problem as been corrected as well. The Eastside System will sound close to simplex. This is a difficult task when you consider you will get repeated 3 times in Spokane and 2 more additional times for Central Washington. There are four additional links when on linked to Seattle. This is accomplished by making the receivers and transmitters flat and direct F.M. for response of 40 Hz to 4 KHz. If you notice the Seattle audio is somewhat conventional (not flat)or even "tinny" is because the extended response feature has not been implemented in that area, as of this printing. This condition requires some user discipline and patience . You probably noticed the repeater has a long tail. There are several reasons. Because of the (transparent) links for the repeater functions there is a slight delay on first time the system comes up. If the system dropped out each time a user made a transmission the first word or two would be cut off. Once the 20 system is keyed up all transmissions go through quickly without anything cut off. (In the same area-not over the link(s)) Therefore, by keeping the system up with a long tail the system is transparent to most users. It also aids as a test for coverage out of town. It also discourages "kurchunking" which is keying up the repeater without identifying. The 20 transmitter in Wenatchee does key up immediately, presently. Another reason is sometimes folks give (annoying) long calls to another because the called station might be scanning several frequencies; by having the 20 carrier up for a while their scanning will probably stop on 20 and be able to receive the call, thus the user can avoid long calls. The link between the two system 20 transmitters uses a two channel, scanning repeater (called the WESTLINK repeater). When a signal comes in the transmitter frequency is steered for the proper traffic direction. This allows one Tx-Rx unit, duplexer line and antenna (sometimes one site unit rent). When linked to Seattle there are more linking repeaters used, another one being a scanning repeater (called the EASTLINK repeater). In between the link repeater are HUB repeaters used for linking all the links together from East to West and back. These are transparent link repeaters. They have no effect to you, the user. The only repeater you observe is the 147.80/20 frequencies. There are a lot of things happening when you key up, but as far as you are concerned it is ONE large repeater on the Eastside on 147.20. All these links cause some delay. One drawback with the scanners, it takes a about 1/4 second for the link to come up completely. Therefore, users need give this time after keying up before talking. It's real easy to forget that when everyone's having a good time with snappy comments back in forth in a 'round table'. The only thing will happen the distant listener will just miss the first word. No big deal, unless the first word is a yes or no answer. With some practice, the user allows for this delay. Users only need to change their mobile transmitter sub-audible tone when commuting across the state and stay on the same frequency of 147.200 MHz. This is also true for the West side 147.20 System. There is some overlap areas to be aware of. Present amateur standards don't allow high stability transmitters, therefore the overlap areas will be difficult to listen to. Attempts to minimize the areas left mainly in Lincoln County and one part of Adams County, I-90 mile post 206-191 area affected. Refer to the coverage map in the index. These affected areas change as much as 10% from weather propagation. The repeater equipment is several brands, including Motorola, GE, Johnson and Midland. Most of the System, was designed and built by Karl. In 1994 he evaluated the first commercial controller in 1994. Later it was scrapped. The controller was good quality, just not designed for a flat audio system. There's another plan to add the 7th receiver for better North mobile coverage. 147.20 coverage is based on a +47 dbm (ERP) mobile,(50 watt, for math challenged readers) except for Spokane city limits, which is based on a +30 dbm (ERP) hand held. ERP means Effective Radiated Power. You take you transmit power out and multiply the power ratio of the antenna gain factor. Most mobile antennas are unity gain. Most hand held "rubber duck" antennas are a loss of 10:1 or -10 db, or worse. Here's a block diagram of the Spokane side of the system, showing basic voting paths. 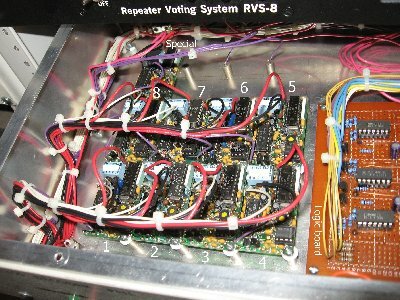 The station control is configured for eight (user) input receivers. Starting with the bottom unit is the "local" 80 receiver on port 8. Next above is some of the downlink receivers listening to remote (sat.) sites. They take the remoted user input signals and feed them into the next panel above, the CTCSS panel, AKA, the decoder. The decoder is an 8-port "AND" gate, where is, the user signal has to be active in at least one receiver, with the correct tone. The left image shows an actual conversation in progress, while being aligned and tested. 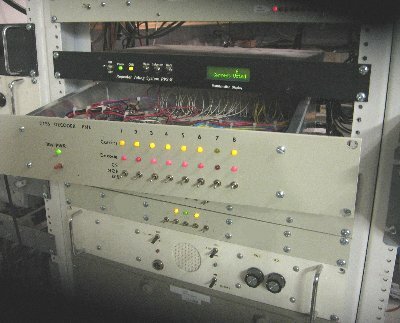 The yellow lights indicate carrier activity on seven of the eight-port decoder panel. The red lights indicate a value (tone) decode. In this case would be the "Spokane" tone. The right image displays the tone decoders, with the logic board to the far right. The decoder then sends all the usable signals to the actual voter panel (black). The voter "decides" the best signal that's usable and "gates" out (mutes) the other less quality signals. During this activity it "liked" # 6. The voter outputs to the system controller,(not shown) which contains addition processing, such as the repeater's IDer and deviation limiter, etc. PM's are important part of running a repeater. Proper physical design consideration pays off for maintenance as well. The unit needs to be able to be "pulled" for easy access to the electronics inside. Being able to do this "hot" is a big plus. For example, a known user for that part of town was noisy and not getting into the repeater very well with his portable radio. During a non-scheduled PM, during an actual conversation in progress, was an easy task to pull and troubleshoot the decoder live and "hot". It was quickly discovered that port-6's tone decoder had an intermittent DIP switch, causing that (remote) receiver to be "ignored". With a quick switch "exercise" the contacts came back 100%. Within minutes the decoder panel was screwed back onto the 19" rack and operation as normal with port 6 now selected on the voter, as you can see on the image. 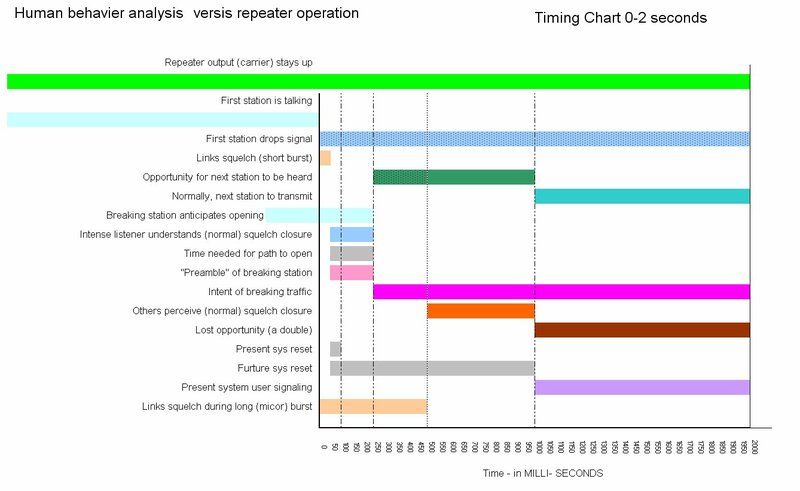 Another part of the repeater (system control) is timing of the complex switching and user habits. There are some delays on audio paths when accessing the repeater. A skilled operator will know how to work with this, especially on a "round table" going on. Here's a chart to display the various senereos and thoughts a user may have to deal with.